Satisfy your culinary cravings with delicious truffle infused cuisine, paired with the finest Barolo and Barbaresco wines in an idyllic setting, amidst rolling plains, mountainous green hills and the Alps. This is Piedmont, which boasts one of Italy’s finest winegrowing regions, contains the UNESCO World Heritage Listed Langhe area, produces the world-famous Alba white truffle and is at the centre of the Slow Food movement. Throughout this culinary discovery, partake in a local wine appreciation lesson from a master sommelier; experience the thrill of a truffle hunt; visit an aged cheese producer; shop at a local market and partake in a cooking class; visit the picturesque towns of Alba and Barolo; relax in two magnificent rural retreats; and indulge in food, wine and truffles at wineries and a Michelin star restaurant. 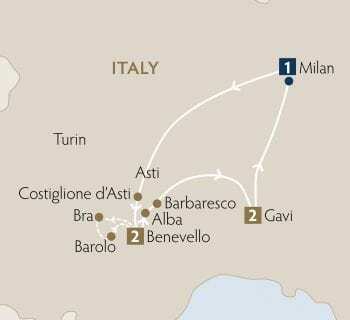 Welcome to Milan for the upcoming regional discovery of nearby Piedmont. Transfer to your hotel and enjoy the day at leisure in readiness for tomorrow’s departure. After breakfast, depart for Piedmont, Italy’s picturesque region of mountains and valleys, overrun with vineyards, castles and incredible cuisine. Our regional discovery begins with a thrilling truffle hunt with hunting dog on a family property that has been passed down through generations. Unlock the mystery and allure of the truffle and enjoy the find with a light lunch, paired with local sparkling Asti wine. Afterward, continue through Langhe, a UNESCO World Heritage listed area to check into an amazing rural retreat. Freshen up and relax before embarking on a late afternoon wine appreciation masterclass and tasting with a sommelier. Once the seat of the Savoy Empire, Piedmont is known for Barolo and Barbaresco, the wine of kings and queens made from the Nebbiolo grape, that are among the most coveted wines in the world. The evening is yours to relax at this rural paradise. Visit a family cheese business established in Bra in the 1920’s and learn the secret of aging to reflect the tradition of the territory. Enjoy a cheese sampling before venturing into Barolo for a tasting and lunch on a winery overlooking the vines. In the afternoon, enjoy time to explore the town of Barolo, the namesake city for the ‘king of wines and the wine of kings’, before returning to the hotel to relax and freshen up before a magnificent 3-course dinner and pairing in Chef Damiano Nigro’s one star Michelin restaurant. Enjoy a guided tour of Alba, considered the capital of Langhe and formerly known as the city with a hundred towers. The town features the Romanesque Alba Cathedral, dating to the 12th century, and is home to the world-renowned Ferrero confectionery company. Afterward, enjoy time for self-discovery and independent lunch which may include the famed 3 star Michelin restaurant, Piazza Duomo. 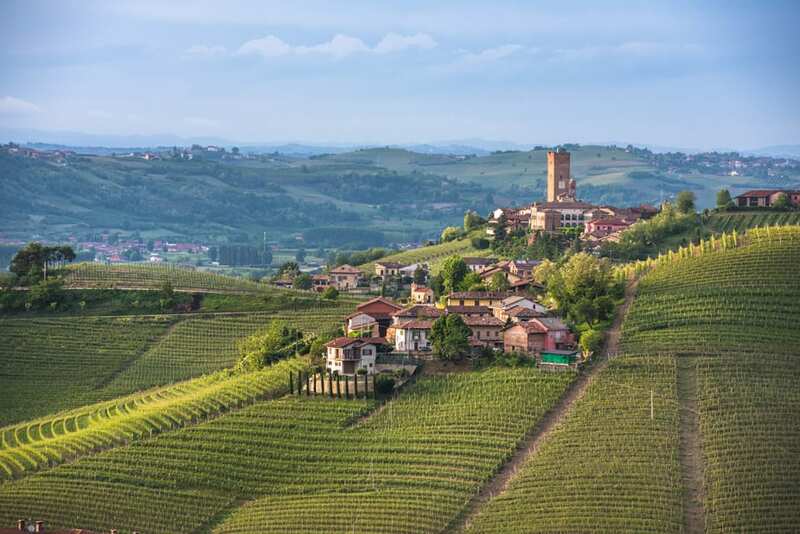 In the afternoon, venture to a Barbaresco winery for a tasting and an incredible view of the Barbaresco Cru hills, before continuing to Gavi to check into another amazing retreat. In the evening, visit the properties impressive cellar before enjoying a degustation dinner in its fantastic restaurant. Visit the market to source your fresh ingredients for a special cooking class and learn the culinary secrets of select local dishes. Afterward, enjoy the fruits of your labour with a celebratory closing tour lunch. The afternoon is yours to relax at the hotel or perhaps walk or cycle to nearby wineries. After breakfast, return to Milan for your ongoing journey or possibly head south to Liguria’s Cinque Terre coastline or to Tuscany.